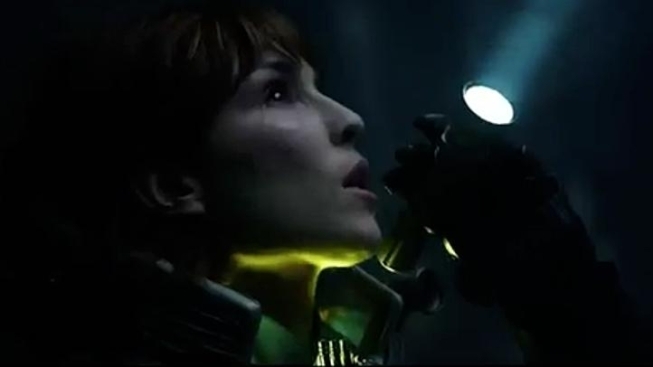 Noomi Rapace, Michael Fassbender, Guy Pearce, Idris Elba, (Tom Hardy lookalike) Logan Marshall-Green, Charlize Theron star in this story about "a team of explorers discover a clue to the origins of mankind on Earth, leading them on a thrilling journey to the darkest corners of the universe. There, they must fight a terrifying battle to save the future of the human race. Scott has said "Prometheus" shares "the DNA" of "Alien," which is just an obnoxious dodge. The two films feature the android-building Weyland family and monsters straight out of H.R. Geiger's nightmares--it sure looks like a prequel to us. As much as we enjoyed the previous viral video starring Guy Pearce, we'll warn you that the one below tips the movie's hand a little too much for our liking. You've been warned, watch it at your own discretion.